At the bottom of this post are the results of analyses of the Ust’-Ishim genome. The Ust’-Ishim sample is from a human femur found on the banks of the Irtysh River in western Siberia. The femur was dated to 45,770–44,010 BP. Ust’-Ishim was male. His Y-SNP calls and mt-SNP calls confirm the published findings that he belonged to Y haplogroup K(xLT) and mitochondrial haplogroup R. Ust’-Ishim also had positive calls for Z4842/M2308 and CTS11667, two of the seven mutations that define Y haplogroup X. Haplogroup X is ancestral to haplogroup NO, the main Mongoloid Y haplogroup. The Veddoid South Asian or Indian components were the largest components for Ust’-Ishim for all of the calculators that had such components. The second-largest components tended to be Mongoloid Southeast Asian or East Asian components, which is consistent with Ust’-Ishim belonging to a Y haplogroup that was ancestral to the main Mongoloid Y haplogroup. Below are the genotypes for Ust’-Ishim for SNPs that have a large effect on phenotype. Derived alleles are in bold. As I predicted in this comment, Ust’-Ishim didn’t have the Mongoloid EDAR mutation. The only derived alleles that Ust’-Ishim had were those in the genes ASIP and KITLG which gave Veddoids brown rather than black skin. These alleles were passed down to Veddoids’ Caucasoid and Mongoloid descendants. It was estimated in this paper that the selective sweep for the KITLG mutation started around 30,000 years ago, but I never believed such a late estimate. The fact that Ust’-Ishim had all of the Veddoid depigmentation mutations 45,000 years ago shows that selection for lighter skin began far earlier. EDAR        rs3827760   AA        Mongoloid teeth, hair, etc. It was nearly two years ago, in a comment on this post, that I, for the first time in history, gave a correct account of extra-African human evolution, in which Negritoids in India evolved into Veddoids, and Veddoids then evolved into Caucasoids and Mongoloids. The correctness of that account was later proven by my analyses of the Tianyaun sample here and here, which showed that the largest components for Tianyaun were the Veddoid components. And my account has now been proven correct again by the results below, which show that the Veddoid components were also the largest components for Ust’-Ishim. It was my correct understanding of extra-African human evolution that enabled me in this post to construct a correct phylogeny for Europeans and Amerindians, and to then use that phylogeny to calculate expected values of f3 statistics that were close to empirical values. My phylogeny was presented in opposition to the preposterous phylogeny, shown below, that David Reich and his associates gave in this paper, and which the entire “HBD community” then foolishly swallowed. My ideas about extra-African human evolution were influenced by Ernst Haeckel’s work Natürliche Schöpfungsgeschichte (Natural History of Creation), which was first published in 1868. Haeckel was a German biologist, philosopher, and artist who did more than anyone else to promote the work of Charles Darwin in continental Europe. In Natural History of Creation he gave an outline of the evolution of all life on Earth, from the most primitive single-celled organisms to the highest races of man. One of Haeckel’s key insights in the book was that humans can be broadly divided into woolly-haired races (Ulotrichi) and straight-haired races (Lissotrichi). It was this insight that led me to realize that Veddoids were the common ancestors of Caucasoids and Mongoloids. Darwin believed that humans had originated in Africa. 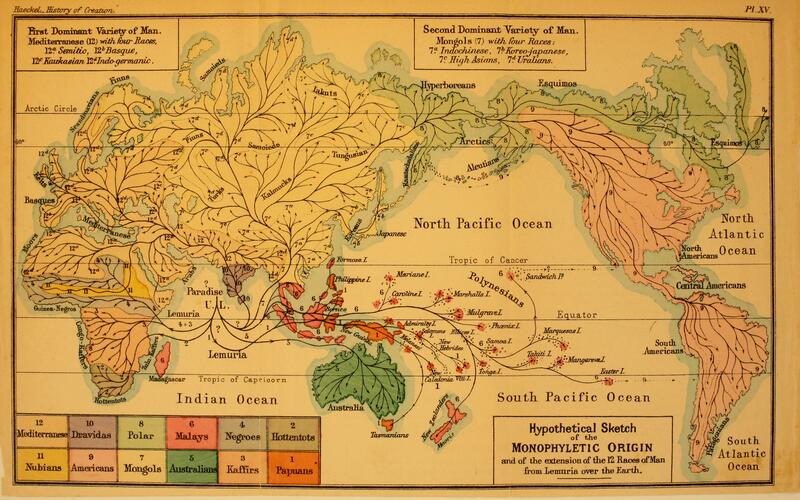 As shown on the first map below, in the earlier editions of Natural History of Creation Haeckel had placed the origin of humans in the sunken continent of Lemuria, beneath the Indian Ocean. The existence of Lemuria had been proposed to explain the similarities between the fauna of Madagascar and India. It was only much later, after the introduction of the theory of continental drift by the German geophysicist and meteorologist Alfred Wegener in 1912, that it would be understood that Madagascar and India were once part of the same landmass, and that India had broken away millions of years ago and moved to its present location. 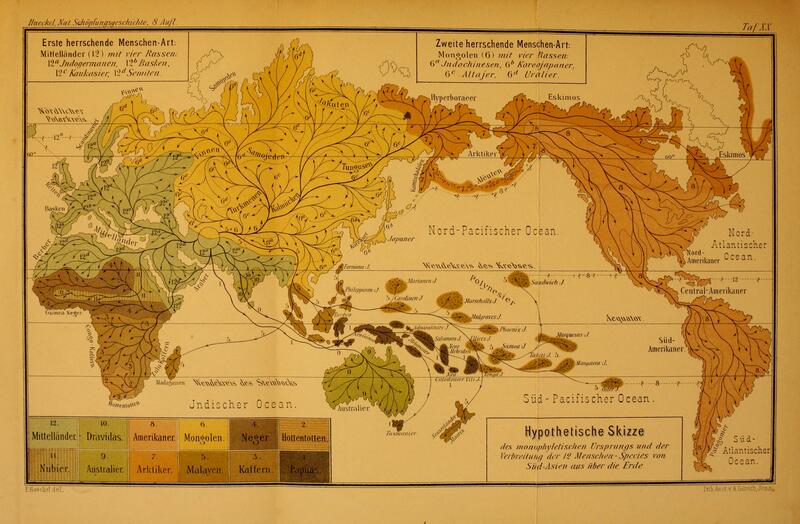 By the time of the 8th edition of Natural History of Creation, published in 1889, geological knowledge had progressed to the point that the existence of Lemuria was in doubt, and Haeckel moved the place of origin of humans to South Asia, as shown on the second map below. In a way both Darwin and Haeckel were right. The very earliest branches of Homo sapiens, belonging to Y haplogroups A and B, and represented today by the woolly-haired Bushmen and Pygmies, did originate in Africa. But the straight-haired Veddoids, belonging to Y haplogroup CF, and their Caucasoid and Mongoloid descendants, originated in Haeckel’s place of origin, South Asia. And if Y haplogroup DE originated in the Negritoids of tropical India, as I believe it did, then even most of the Negroids in Africa can trace part of their ancestry to South Asia. This does not mean Ust’-Ishim is ancestral to NO. It would be interesting to know whether and in how many SNP’s Usht’-Ishim differs from haplogroup NO. I guess there are to many false calls to know for sure. He belonged to a haplogroup that was ancestral to NO. It would be interesting to know whether and in how many SNP’s Usht’-Ishim differs from haplogroup NO. He differs from NO in all SNPs downstream of Z4842/M2308 and CTS11667. I guess there are to many false calls to know for sure. It’s clear from the calls that only a tiny fraction of them can even possibly be incorrect. And of that tiny fraction, some of them are actually called correctly, but only appear to be incorrect because of mistakes in the ISOGG Y-SNP index.